OMAX takes abrasive waterjet cutting to new levels of speed and performance. By combining precision system components, advanced pump technology and innovative software, they have created the most versatile waterjet technology available to manufacturers today. Waterjets from OMAX help manufacturers maximize production with a few unique features. OMAX waterjets are manufactured in two distinct lines, and are available in a range of sizes and with an array of features. 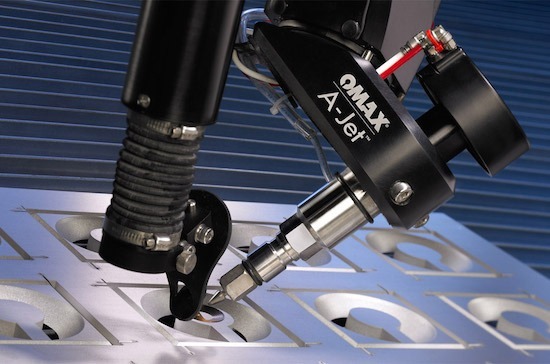 OMAX Machines feature state-of-the-art sheet and tube cutting technology with +/-.001″ tolerances, as well as options such as the A-Jet articulating head for true bevel and 3D cutting. Maxiem Machines feature legendary OMAX technology at a more affordable price, with tolerances up to +/-.003″. If you’re interested in learning more about OMAX waterjets, contact us today to request a quote. We look forward to hearing from you!